I just wanted to post a quick reminder about the blog hop that my Critique Partner Jaycee Delorenzo and myself are hosting! You have a little over a week and a half to sign up and the turnout has been great so far! I can't wait to see everyone's entries :D Now don't forget there will be prizes so show us your delicious heros writer's and authors for a chance at some swag! 1. Pick a hero from your writing in progress or novel. 2. Post a Picture of your Hero! 5. Post our blog button to your blog! Also, it's not required, but feel free to repost the hop! 6. 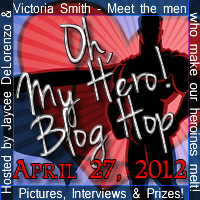 Post your entries on April 27, 2012 and hop around the other blogs through the linky!